Five-time world champion Ronnie ‘The Rocket’ O’Sullivan will be sending delegates ‘Snooker loopy’ at this year’s Betting on Sports conference in London (18-21 September). Appearing as an ambassador for BetCris alongside the operator’s UK representative Hilly Ehrlich, ‘the Rocket’ is set to play a starring role in a session dedicated to why snooker is such a good fit with the bookmakers, held as part of the ‘Sport in Focus’ track. “I’m looking forward to speaking to the delegates at Betting on Sports about the opportunities presented by the sport, and why it will always be such a good fit with the bookies,” said O’Sullivan. This full day track will cover key issues from eight leading sports, including transforming fan enthusiasm for darts into betting interest and countering the threat of match fixing in tennis to secure more commercial ties with the bookmakers. The track is to be held in the Aintree Suite at Olympia Conference Centre and will also deliver insight into building a rugby audience ahead of Japan 2019, harnessing the continual growth of basketball, tackling cricket’s integrity issues and supporting a golfing fraternity that seemingly holds no interest in the betting sponsorship model. Sport in Focus is just one of the six main tracks alongside Betting on Racing, Betting on Americas, Betting on Regulation, Innovation & Technology and Future of Betting. The conference will also play host to ESI London, Casino Beats Summit, AffiliateFEST Conference, SBC Sponsorship Forum and SBC Sports Betting Hall of Fame Awards. 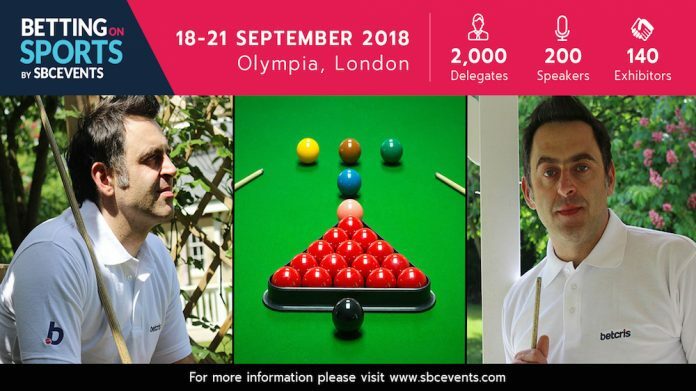 O’Sullivan is no stranger to supporters of SBC Events, having appeared at last year’s SBC Snooker Forum in Marylebone, where he revealed that his unique style of play has forced bookmakers to create a separate predictive algorithm for when he is on the table. He also predicted that 70 to 80% of the sport’s top players will be Chinese within the next 10 years, because the grassroots program in the UK is no match for the conveyor belt of talent driven by 5,000 snooker clubs in Shanghai and 3,000 in Beijing. O’Sullivan said: “I’m proud to be involved in the BetCris mission to push snooker to a wider audience, particularly in China where there is such a vast opportunity to attract new bettors.